Virtual reality opens up a novel perspective in storytelling and engagement. It’s what seeded our VR film projects TreeSense and Tree. In June of last year, we started a research project on understanding and developing body ownership illusion in virtual reality (VR). A couple of months later, our research grew into a VR narrative film we called TreeSense. Then, in October, we started collaborating with movie directors to push the project further and to develop a hyperrealistic VR film, Tree. This work is based on our belief that VR offers new methods for storytelling and engagement. Through systematic alteration of the human body’s sensory stimuli–vision, touch, motor control, and proprioception–our brains can be trained to inhabit different entities. Virtually experiencing a different state of being can lead to a heightening of empathy and of appreciation for the realities of others. To showcase the power of this embodied storytelling method, we decided to create a sensory-enhanced VR film in which users inhabitsa tree—indeed become a tree—seeing and feeling their arms as branches and their bodies as the trunk. Audience members collectively share the experience of being a tree throughout its life cycle—from a seed rising through the dirt, to sprouting branches and growing to full size, to finally being destroyed by fire. We called this project TreeSense. TreeSense from Fluid Interfaces on Vimeo. While we were developing TreeSense, VR film directors Milica Zec and Winslow Porter spoke to our class at the Media Lab. At the time, and by an odd coincidence, they were also developing a similar story about “being” a tree. It was a very exciting bit of serendipity, and we decided to work together in order to transform our ideas into a comprehensive VR film experience, Tree. In the Fluid Interfaces group, we took charge of the design and construction of the tactile experiences that are represented throughout Tree, while artist Jakob Steensen designed its stunning hyperrealistic visuals. In both of the short films TreeSense and Tree, viewers wearsa VR headset and become immersed in a virtual forest. But these projects differ in their tactile technologies. 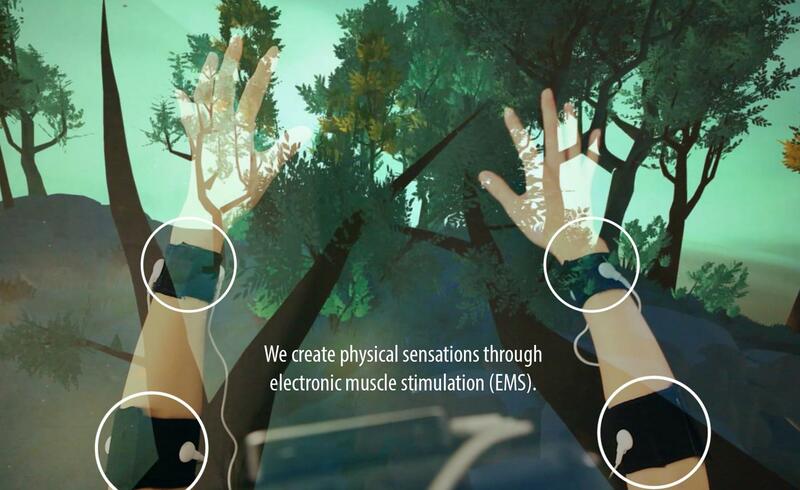 In TreeSense, we rely on electronic muscle stimulation (EMS) to provide visuotactile feedback. We’ve designed a series of EMS signals by varying combinations of pulse amplitude, pulse width, current frequency, and the electrodes’ location. The exciting part of EMS is that we’re able to explore uncommon body sensations, including feeling electricity underneath the skin, or fingers moving involuntarily. Audience members can actually sense their branches growing or getting poked by a bird. This implementation of EMS is definitely experimental. 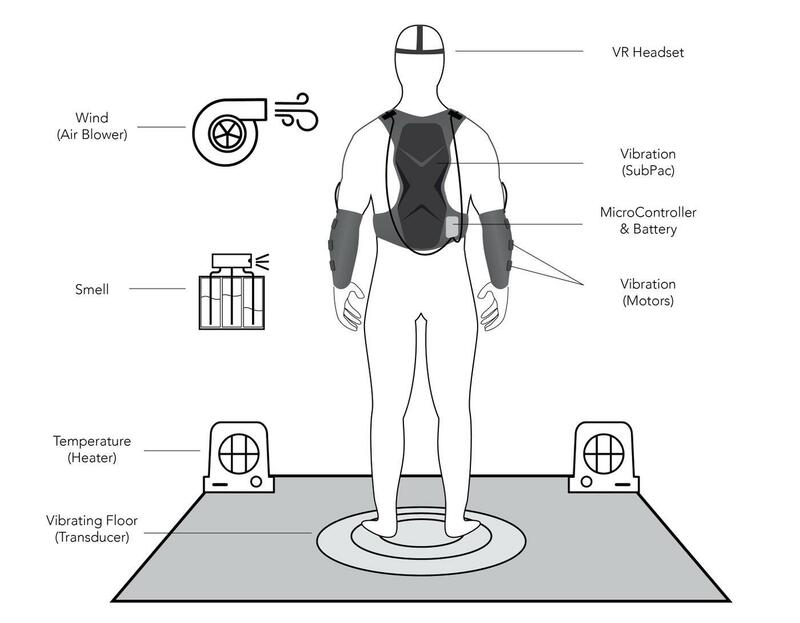 This graphic shows the haptic hardware we use to create the virtual reality tree experiences of movement, air, temperature, and smell. We see the film, Tree, as a polished extension of our project, TreeSense. The VR movie was shown outside the academic environment and seen by hundreds of audiences in 2017 festivals, including Sundance, TribeCa, and TED: The Future You. At the Tribeca film festival, the immersive VR experience of Tree also included the use of scents–the audience literally smelled the dirt, the rain forest, and the fire. So far, the presentations at film festivals and elsewhere have been very well received. We’ve seen audiences coming out of the VR film experience in tears. It’s been exhilarating for us to witness the power of body sensations in this new form of storytelling. People have told us they really felt like the tree and found its destruction to be terrifying and emotional. Meanwhile, TreeSense has just received an interaction prize in this year's Core77 Design Awards and it will be shown at Design Dubai Week in the fall. This gif from TreeSense shows a bird interacting with a tree, as seen and felt by the viewer. Both our projects—Tree and TreeSense—experiment with new methodologies for immersive participatory storytelling by leveraging new technologies such as VR and tactile feedback mechanisms. We’re aiming to evoke believable bodily experiences through electronic muscle stimulation, vibration, temperature, and scents to unlock a higher level of realism. As an audience member said after feeling immersed in Tree, “You know it's not real but your body really believes it!" The design of multi-sensory experiences is a complicated process of composition and choreography. We constantly have to make sure the experiences are perfectly synced, both in terms of timing and intensity. There’s already high-fidelity visual and audio inside the VR headset, but it’s not a trivial thing to add tactile elements to enhance the experience, and not distract or disturb the user. In Tree, we have multitrack bass audios for each part of the body vibration, so that a person can feel the thunder, or the forest fire disturbance, or a bird landing on a branch. The whole tactile experience is digitally controlled by Max/MSP and Arduino software while communicating with the Unreal engine through Open Sound Control protocol. The tactile, olfactory, and temperature feedback in real life is precisely synced with the visual experience inside the Oculus headset. We went through various iterations to match the virtual visual details with the intensity, texture, and timing of the physical experiences. We believe that TreeSense and Tree are tapping into more senses to help people connect with the narrative. We expect that the intimate, visceral, and emotional VR experience also has a real-world impact in that it helps users to develop a personal and immediate identification with the natural environment and the need to protect it. In that sense, Tree is an example of a multisensory VR platform that has vast potential outside the research world. We’re convinced of the technology’s potential value for diverse purposes in many areas, such as telecommunication, active learning, and even medical applications. We are actively exploring these possibilities now. Xin Liu is a research assistant in the Fluid Interfaces group at the MIT Media Lab. She will graduate with a master’s degree in August 2017. Yedan Qian is a visiting student in Fluid Interfaces. Advisor: Pattie Maes, head of the Fluid Interfaces research group at the MIT Media Lab. Collaborators: VR filmmakers Milica Zec and Winslow Porter.